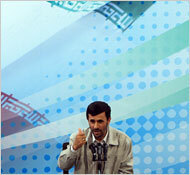 A former Iranian president warned the West that its support for Israel would backfire. The Bush administration is coming to an end. The U.N. Security Council is divided and does not seem inclined to impose new sanctions on Iran. As you come to the U.N., do you feel like you are winning this confrontation with the U.S.? You have said repeatedly that the state of Israel should disappear from the map. What action does Iran plan to take to bring about the result of Israel’s disappearance? Or is this just nothing more than talk? Iran has made its proposal loud and clear: We’re calling for free referendums for the Palestinian nation to determine their own government. This will be reflected in a proposal which we will soon submit to the U.N. secretary-general. Palestine constitutes a nation that has lived there for hundreds if not actually thousands of years. Now, with the pre-planned thinking, [Israel has] actually displaced over 5 million people from their own lands and collected other people elsewhere from the world and has put them in their place. How is it possible to recognize a state that has come about as such? "Judaism seeks peace. Unfortunately, there are some Jews today, influenced by the barely century old, philosophy of Zionism, who feel that the proper Jewish response to enemies, be they real or fantasized, is aggression and calls for violence and unfortunately attempts to drag other nations down the path of war."